Are You Required to Have Federal Past Performance? When helping clients with their Capability Statements, a common question we hear at TargetGov is, “do I have to have Past Performance with the Federal Government?” This is an excellent and pertinent question, because the Past Performance section of your Capability Statement showcases your proof that you can do the work you say you can do. Because of this it is one of the key components in alleviating risk. It is better to have Past Performance with the agency you’re trying to work with, or with the Federal Government in general because then they know that you’re familiar with their system and way of doing things. But what do you do if you don’t have any past experience with them? Keep the purpose of the Past Performance section in mind, as it will help you understand what to do. More important than including Federal Past Performance is including recent and relevant Past Performance. If your company is able to perform many services then you want to highlight the ones most related to the services you’re trying to compete for. What kind of work is being asked for? That’s the kind of work you want in your Past Performance Section. If you lack Federal experience, the second-best place to have experience is with state and local governments. This shows that you have experience not only in doing the required work, but also in contracting with government entities. But what if you don’t have any government Past Performance? Is commercial work okay to include? Again, we must go back to the purpose of Past Performance. If the work you did commercially is relevant to the work you are attempting to procure and does a good job of showing off what you and your company can do then it is acceptable to use in your Capability Statement and might even help differentiate yourself from others who have generic government experience. All in all, what is most important about Past Performance is showing your target customer that you are the right company for this opportunity because in the past you’ve had great success and are able to showcase that success. For more information about gaining a leg up with your Capability Statements, read “3 Steps for Tailoring your Capability Statement.” Feel free to comment below or contact us directly if you have any questions or concerns about your Past Performance. Great info! I have past performance with the federal government as CEO of a different company. I’m no longer involved with that company and have launched a new business. How should past performance be handled with a new startup that has not yet performed any work? I hope this helps. Let me know! And we would be happy to help in your business development efforts, please contact us. What if you’ve just started a brand new business and said business has zero experience to list in the past performances section of the capabilities statement? Thank you very much for visiting our website and reaching out with your question. This is a complicated issue, without a quick answer. It is important to never confuse personal experience with a company’s past performance. In fact, past performance has a legal definition in the federal marketplace. If you business is completely new and without past performance, I suggest you watch our webinar on capability statements. It has lots of advice and suggestions which I believe will help you. 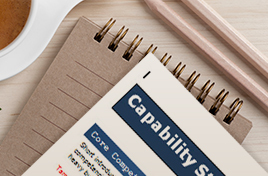 The capability statement is perhaps your most important marketing tool. It is worth the effort to carefully craft your new business’ capability statement, and the webinar has lots of important advice on all aspects of it. If you are interested in seeing the webinar, it can be found for purchase under our products and services. If there is anything else I can do, please don’t hesitate to get back in touch.